In November 2015, HRC, in partnership with Trans People of Color Coalition (TPOCC), released a report detailing the violence facing transgender people, the realities that conspire to put transgender people at risk, and solutions that can be pursued by policymakers, advocates and public and private sector leaders to address this national crisis. In 2015, at least 21 transgender people have been victims of fatal violence in the United States, more killings of transgender people than any other year on record. 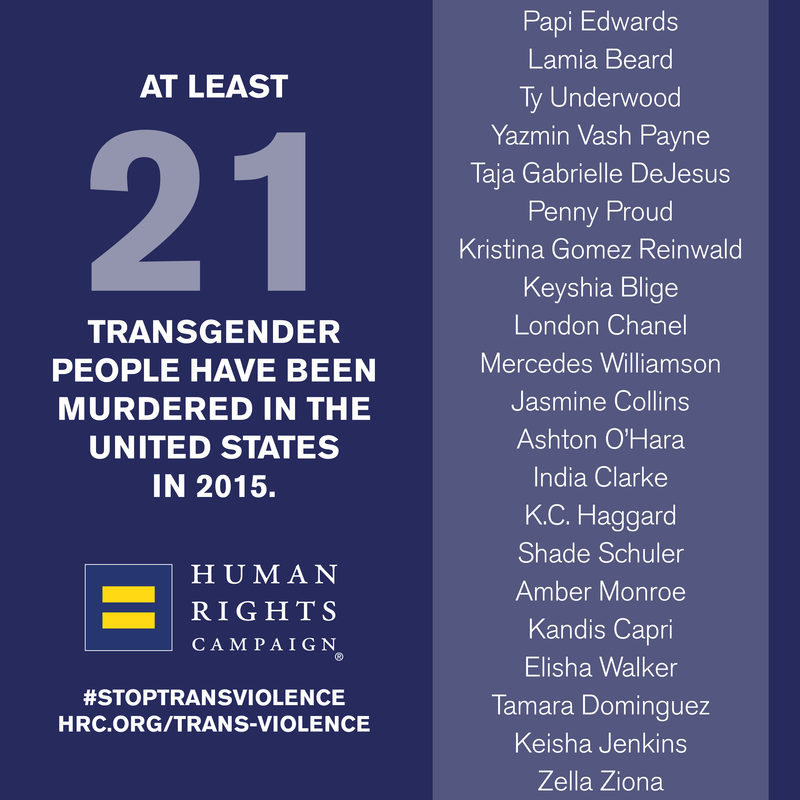 More transgender people were killed in the first six months of this year than in all of 2014. While we don’t know many details about these victims’ experiences, research shows that transgender people face harassment and discrimination in numerous contexts throughout their lives. Moreover, we know that the chances of facing discrimination, harassment and violence increase exponentially for transgender women of color, who also face racism and sexism. For many transgender women of color, the threat of violence is constant, and there are few if any places they feel safe. The victims whose stories follow are more than alarming statistics. They were human beings with friends and loved ones. They were sisters, daughters, advocates, people of faith, students and friends, who had hopes and dreams, and who in too many cases suffered more than their share of challenges. May their tragic deaths inspire us all to join in the fight for justice and equality for transgender people everywhere.